When you discover the infidelity demon in your marriage being a basket case is normal, as attested to by the fact that hundreds have come to me with their pain, confusion, rage and numbness upon discovery of their cheating spouse. Being a basket case has nothing to do with your intelligence or competence. You may have always seen yourself as a can do and talented individual. Infidelity causes you to question everything about yourself including these beliefs. Being a basket case is normal. Here are a few reasons why it is almost impossible (at least at first) to avoid Basketcaseitist. 1. Upon the discovery of infidelity most question: “What did I do wrong? I probably was not good enough sexually! What IS wrong with me that my partner has to look elsewhere? Where didn’t I meet his/her needs? I must be defective. S/he found someone else to love and I must be unlovable now. Such thoughts are common, since our culture has a distorted view of love. 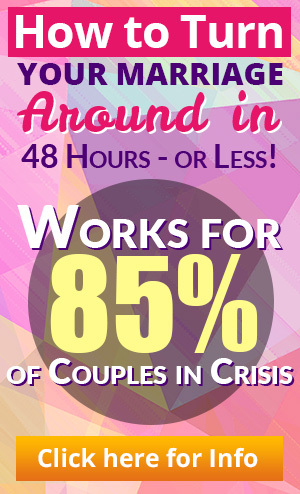 It is subtly embedded within us as we watch television, romantic comedies or read the tabloids moving through the grocery checkout, that “being in love” is the ultimate – whether it is with your spouse or someone else. “Being in love” is the goal in relationships. And if someone must go somewhere else to find that “loving feeling” the relationship or other person in that relationship must be tainted or incapable of maintaining that love. 2. Infidelity is like being raped. Something sacred, something vitally important has been violated. Boundaries of loyalty, trust and promises of fidelity, care and concern are mocked without seemingly much regard. The wounded spouse is stunned that such insensitivity could occur, especially by someone whom s/he thought s/he trusted. 3. It seems as if one is about to lose his/her world. And by world, I mean all of it. At risk is losing one’s spouse, losing financial security, losing one’s home, losing one’s extended family, losing closeness to children, losing one’s dreams and hopes and losing any sense of normalcy and predictability about life. One may withdraw in fear. One may lash out in fear. One may fight out of fear. One may plead and beg out of fear. One may resort to unthinkable behaviors because s/he is terrified – and I mean terrified. The world feels like it is crumbling and crashing down. And, there is no vision of what might be left. 4. One feels terribly powerless. 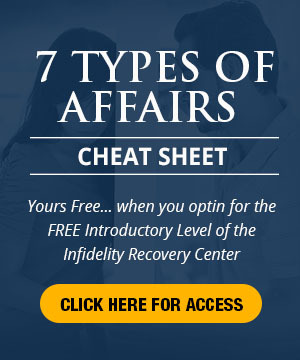 It is s/he, the cheating spouse, who seems to be calling the shots, who is doing whatever s/he chooses to do and there is very little the wounded spouse can seemingly do to stop the nightmarish behavior of the cheating spouse. The cheating spouse is giving all the power and attention to the other person and is oblivious to the pleas, concerns and requests of the spouse. After first discovery, the wounded spouse may attempt to exert control or power upon the situation, but soon finds that the efforts are fruitless. 5. The wounded spouse is often blindsided. S/he did not see it coming. Life was rolling along (yes, things seemed a little off… but what marriages DON’T experience that?) and all of a sudden one is sucker punched. S/he thought there was an agreement that, even though times might get tough, neither one would resort to infidelity. But here it is. Unexpected. Unwanted. Without time to prepare for the intensity of the feelings and the thoughts that just won’t go away. 6. The personal neediness of the wounded spouse is exposed. Now, none of us want to be known as “needy.” But when infidelity raises its ugly head one’s neediness is front and center: the need for a hug, the need for affirmation, the need for attention, the need to feel loved, the need to be safe and the need for predictability. All these needs are magnified and their intensity level soars. And, the wounded spouse may resort to unthinkable behaviors to get those needs met or at least know there is a possibility of them being met… sometime. Take heart, the intensity of your feelings and the frightfulness of your thoughts are normal. And, basketcaseitis passes with time as you understand the type of affair and what about your cheating spouse (not you, nor the marriage) motivated the infidelity. This entry was posted in Infidelity Marriage, Infidelity Pain, Infidelity Reasons, Marital Crisis and Self Esteem, Surviving Infidelity, Types of Affairs and tagged discovery of infidelity, infidelity and self esteem, Infidelity Pain. Bookmark the permalink. Thank you for confirming that my “basketcaseitis” is normal. Unfortunately it has been 3 years of “basketcaseitis”. I have to make this pain stop! Thanks again for your thoughtful and comforting messages! How does the basketcase feelings last? When does it become not notmal. It has been nearly 11 months for me.